So I made these last night for a delayed mothers day dinner for my mother-in-law. It really turned out yummy considering I started dinner at 6 (I fell asleep on the couch with my baby earlier when I was suppose to be cooking) and they all showed up at 7. 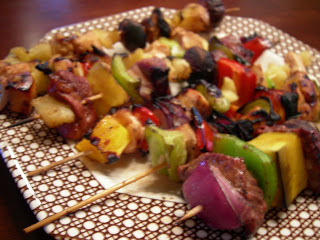 But, I was surprised how fun and easy these kabobs were! Then cook to your liking. These look really good!! Did you make the strawberry (tart?) too? If so, do you have the recipe as well? That looks like a great meal! 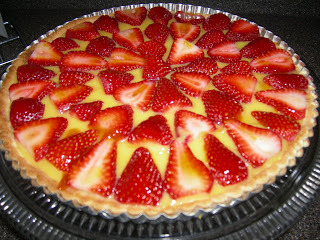 I did make the Strawberry tart too .. It was my super quick version. *Store bought dough rolled out on pie pan. *Vanilla instant pie filling pudding. My secret is out I suppose. … I guess it looked fancier than it was.